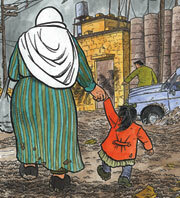 Weekend America: Joe Sacco's "Palestine"
TRIVIA: What do you know about the middle class? Desiree Cooper: How has your work evolved since "Palestine?" Joe Sacco: For the better. Well, I hope so. As much as I like the first book, "Palestine," as much as I feel like that has a power that I don't know if any of my other books have had since, I'm more conscious of what I'm doing, I'm more aware of how to go about things. It's become more journalistically, I don't want to say the word "precise," but I have a better understanding on how to get a story and that just comes with experience. With the drawings, I have probably toned them down somewhat. I let the drawings work with the writing and with the story more than I used to. Even if it means drawings that when I'm doing them are kind of boring to draw, but they work for the story. When you draw yourself, you wear glasses and the glasses are opaque. They're white. And I'm thinking, well here's the guy I'm supposed to be seeing everything through his eyes and yet I can't see his eyes. Tell me about that choice. You know, it's funny. It sounds a little silly, but it's that whole notion of the eyes being the window to the soul. And I guess I want people to see part of my personality. I want them to get a feeling for my personality, but I know the reader isn't really going to get to know me personally. And there's a certain emotion you feel in those situations when you're hearing these terrible stories and you're seeing terrible things. And you want to sort of hide that on some level because if you demonstrate it, I think it gets in the way. It's not that important that I was emotional during certain scenes. What's important is that the reader gets the impact of the story. And so maybe that's what the opaque glasses are about. In reflections that you add in the preface of your book, "Palestine," you end that reflection with saying that your idea was not to present an objective book, but an honest one. What did you mean by that? I think with journalists, too much attention is paid to this notion of presenting a so-called objective picture, which generally often can mean, you go, you talk to some people, and then you go to the spokesperson on the other side and get a quote to balance it out. But I find sometimes this balancing it out, what that involves is washing it out so that what the journalist actually knows is going on or what they really feel is an important point is being sort of lost. And a journalist often thinks he or she is done when they've presented both sides of the story. What I want from a journalist is what they would tell me if they were sitting across from me at dinner. What is going on over there? You tell me. That's what I want. But I want an honest appraisal of what's going on. And that's what I meant by that. What do you say to those critics who say that what you have created isn't objective or isn't balanced, that it is very much slanted to one side? I say they're right. I say it isn't objective. I say it isn't balanced. What I am doing, when you say slanted to one side, I think of it as presenting one side that isn't well told and telling it honestly. In other words, if you're talking about the Palestinians, if you hear things that you don't feel like isn't good for their cause, you're still going to report that because that's just part of the story. You're being honest about the warts, but you are trying to present their story from their point of view. Well, now you're writing a book about the Gaza Strip and you actually took your other book "Palestine" with you when you were researching that. What kind of reaction did you get from people when you showed it to them? It's funny because when I was first doing journalism comics, I was a little hesitant to tell people I was doing this in comic book form as a cartoonist. Now, I find it really helps with people, especially if they're not English speakers, or English language proficient. Because what I found is, I would sit in someone's home in Gaza, let's say an old man in his 70s, and I would hand him the book "Palestine"and he would get it right away. He would open it up, and he'd see pictures of the refugee camp, pictures of his life, or something he understood, and he'd get right away what I was trying to do. And I thought, well, if I'd written a book in prose and handed that to him, he might have nodded his head, "Thank you for the effort," but he wouldn't have got it. He wouldn't have known really what I'd written. Quote to the previous comment: "So you consider your self fully literate Albert?" I must use irony here, but does it mean that your knowledge is bigger or more correct? Would that knowledge by any means claim that the Jews had the right to make Israel by destroying another country and people, and would that be supported by a ancient belief and book??? And would that give a fully literate commentator right to "objectively" call resistance of people being destroyed by the Jews (and others) for terrorist??? I really think both objectively and honestly that it should be the other way around; like it was with Jews under 2. world war; majority of normal people won't say that the Jews were terrorist in that case now would they? Joe Sacco admits that his writing is not objective but "honest". The opposite of objective is subjective. Being subjective can be honest or dishonest but it clearly is onesided. Is there a market for a subjective story on the terrorist organization Hamas that runs the Gaza Strip? Clearly Joe Sacco and his publishers thinks so. But in employing the comic book form they seem to address a semiliterate reading public. Perhaps that is where they expect the most success.